Amazon has officially announced what was rumored for some time, that Amazon Prime subscribers will be given access to over 5000 streaming movies and TV shows through their Instant Video program. There are currently over 200 compatible devices on the market that can view these programs. Netflix has attempted to transition some of their customers to their streaming product with some success but ultimately have not achieved the level of success they were hoping for due partly to the limited catalog available due to licensing issues. 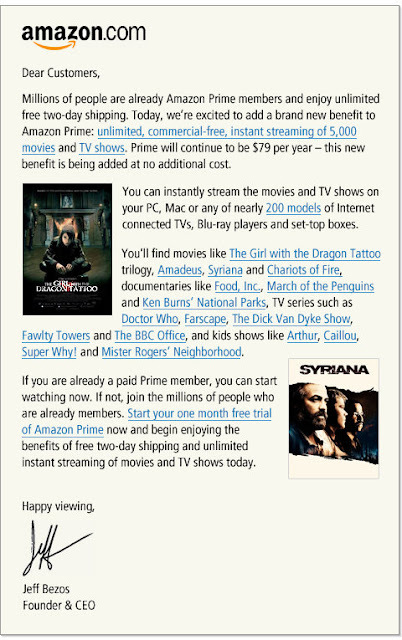 Amazon's initial offering of titles looks very similar, but where they currently differentiate is that Amazon also has premium titles available for a one time rental fee. To get the same movies through Netflix you need to go the old school way of having discs mailed out. Will Netflix get licensing worked out and charge for streaming premium movies? Do consumers want that? Will the costs of mailing DVD's over the country bury the company now that they will have to adjust pricing due to competition in a market where they were operating alone? The Hollywood Economist had detailed what Netflix was going to be up against just last December. Now that Amazon has made their move, it will be interesting to see how Netflix adjusts. What's your prediction? We just started using Netflix in the Fall. I would say the quality of their streaming is not the best. Any idea about Amazon's? I can't see them falling apart soon, but they definitely could be in trouble because they're not going to have the resources to compete with giants like Amazon, Google and Apple. You also nailed it as far as quality - Netflix, at least the last I tried, was not streaming much HD quality video(that had to have changed by now I'd hope). Amazon does. Now, my experience with Amazon's service is even more limited than Netflix's but I have streamed a HD movie on my Tivo through Amazon and it looked and performed great.